"On Tuesday night, Jan. 19, 1742, Mrs. Edwards observed, 'I felt very uneasy and unhappy, at my being so low in grace. I thought I very much needed help from God, and found a spirit of earnestness to seek help of him, that I might have more holiness. When I had for a time been earnestly wrestling with God for it, I felt within myself great quietness of spirit, unusual submission to God, and willingness to wait upon him, with respect to the time and manner in which he should help me, and wished that he should take his own time, and his own way, to do it. The next morning I found a degree of uneasiness in my mind, at Mr. Edwards’s suggesting, that he thought I had failed in some measure in point of prudence, in some conversation I had with Mr. Williams, of Hadley, the day before. I found, that it seemed to bereave me of the quietness and calm of my mind, in any respect not to have the good opinion of my husband. This, I much disliked in myself, as arguing a want of a sufficient rest in God, and felt a disposition to fight against it, and look to God for his help, that I might have a more full and entire rest in him, independent of all other things. I continued in this frame, from early in the morning until about 10 o’clock, at which time the Rev. Mr. Reynolds went to prayer in the family.'" "The presence of God was so near, and so real, that I seemed scarcely conscious of any thing else. God the Father, and the Lord Jesus Christ, seemed as distinct persons, both manifesting their inconceivable loveliness, and mildness, and gentleness, and their great and immutable love to me. I seemed to be taken under the care and charge of my God and Saviour, in an inexpressibly endearing manner; and Christ appeared to me as a mighty Saviour, under the character of the Lion of the tribe of Judah, taking my heart, with all its corruptions, under his care, and putting it at his feet. In all things, which concerned me, I felt myself safe under the protection of the Father and the Saviour; who appeared with supreme kindness to keep a record of every thing that I did, and of every thing that was done to me, purely for my good. The peace and happiness, which I hereupon felt, was altogether inexpressible." "This lively sense of the beauty and excellency of divine things continued during the morning [of Friday 28th Jan], accompanied with peculiar sweetness and delight. To my own imagination, my soul seemed to be gone out of me to God and Christ in heaven, and to have very little relation to my body. God and Christ were so present to me, and so near me, that I seemed removed from myself. The spiritual beauty of the Father and the Saviour, seemed to engross my whole mind; and it was the instinctive feeling of my heart, ‘Thou art; and there is none be-side thee.’ I never felt such an entire emptiness of self-love, or any regard to any private, selfish interest of my own. It seemed to me, that I had entirely done with myself. I felt that the opinions of the world concerning me were nothing, and that I had no more to do with any outward interest of my own, than with that of a person whom I never saw. The glory of God seemed to be all, and in all, and to swallow up every wish and desire of my heart." "I felt more perfectly subdued and weaned from the world and more fully resigned to God that I had ever been conscious of before. I felt entire indifference to the opinions, and representations, and conduct of mankind concerning me; and a perfect willingness that God should employ some other instrument than Mr Edwards in advancing the work of grace in Northampton. I was entirely swallowed up in God, as my only portion, and his honour and glory was the object of my supreme desire and delight. At the same time, I felt a far greater love to the children of God then ever before." Jonathan Edwards was overjoyed to return home to find his church in the grip of a powerful awakening. His deep theological understanding and penetrating discernment made him a shrewd judge of spiritual experiences. What he looked for was not unusual effects on the body or impressions on the mind, but the renewal of the heart. In his great book on revival and Christian experience, The Religious Affections, he argued that the proof of a genuine experience of God is seen in its lasting fruit. Those who have encountered God in Christ by the power of the Spirit will be filled with joy inexpressible and full of glory. As God is love, those who enjoy the deepest communion with him will be filled with love for God and his people. They will have a profound yearning after holiness. Edwards carefully analysed his wife's experiences and concluded that her raptures were of God. He was especially struck by his wife’s intense spirit of love and benevolence. 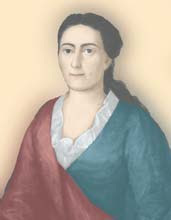 "At night, [said Sarah] my soul seemed to be filled with an inexpressibly sweet and pure love to God, and to the children of God; with a refreshing consolation and solace of soul, which made me willing to lie on the earth, at the feet of the servants of God, to declare his gracious dealings with me, and breathe forth before them my love, and gratitude, and praise. However, despite such blessings, tensions arose between Edwards and the Northampton Church. Tensions that would lead to his dismissal in 1750. The pastor asked for a rise in his stipend due to rising prices, but the church would only consent after investigating the Edwards' material affairs. Some were outraged that their extravagant minister had two wigs and two teapots! I assure you ladies that your pastor does not posess even have one wig, although we may have several teapots! In addition, Edwards argued that only those with a credible profession of faith should take the Lord's Supper. This brought into question the "Halfway Covenant" policy of Solomon Stoddard which allowed the unbelieving children of church members take the Lord's Supper. Vested interests mobilised against Edwards. The issue of the Lord’s Supper was complicated by the fact that members of the town council had to be communicants of the Congregational Church. Spending thirteen hours each day locked away in his study hardly helped him gain his people’s support in this time of crisis. He also handled a matter of church discipline in a rather unwise and high handed way. In the end it all got too much and Edwards was voted out. * Notes of a talk given at our Penknap Ladies' Meeting.